A book for railroad history lovers that want to know more about railroads in Ohio. 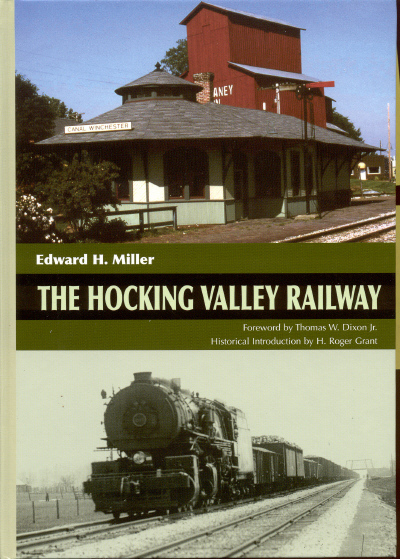 Published by the Ohio University Press, The Hocking Valley Railway is 347 pages with many photographs, maps and charts. The Hocking Valley Railway was once Ohio's longest intrastate rail line, filled with an endless string of trains carrying primarily coal but also iron and salt. Despite its size and its significant economic and social impact, few people today are familiar with its history. In The Hocking Valley Railway, Edward H. Miller traces the trajectory of a railroad company from its beginnings in 1867 as the Columbus and Hocking Valley, built to haul coal from Athens to Columbus. Miller describes how extensions and consolidations ultimately created the Columbus, Hocking Valley and Toledo, a 345 mile railway, reaching from the Lake Erie port of Toledo to the the Ohio River port of Pomeroy. Every aspect of its development, its peak, and its ultimate demise is dealt with here. Replete with almost two hundred photographs and illustrations, The Hocking Valley Railway also documents a historic transformation in Midwestern transportation from slow canal boats to fast passenger trains. Historians and railroad enthusiast will find much to savor in the story of this ever-changing rail line and the people who ran it. Edward H. Miller is retired from Hocking Valley Railway successor CSX. This is his first book, which has been more than thirty years in the making.